Would you like contacting if or when earring-holder becomes available again?" Earrings are so pretty and a lot of us have quite a collection. Clearly some sort of organiser is needed. The obvious choice is to put them on a tree or stand. But then they are on display for all to see, including the dust bunnies and pinching borrowers. Enter tar-rah! This beautiful crystalline earring holder. Taking 125 pairs (we mentioned a collection!) 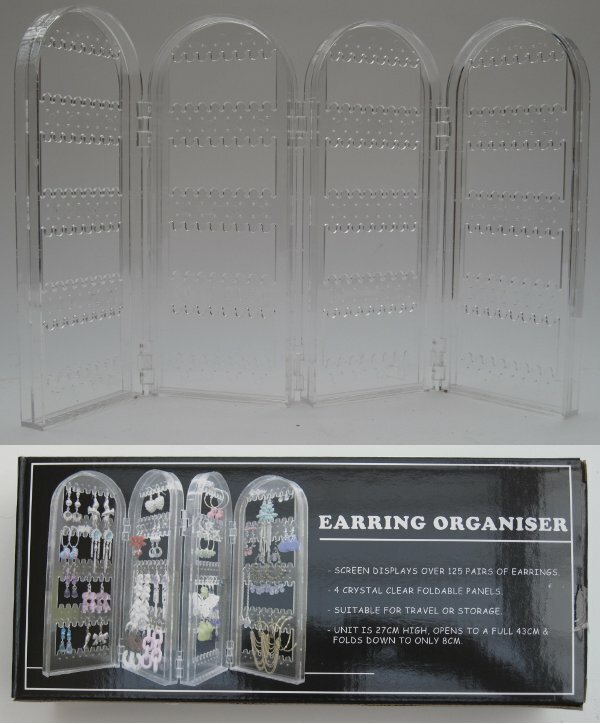 spread over four panels, your dangly jewellery is organised. This earring holder folds up. You have practical storage you can slip in a drawer or pack in luggage and travel with. There`s no knotting up, no bits being pulled off, no tangling. And your treasures are not on display for all to see. Unless you want them to be. The case is 27cm high, opens to a 43cm screen and folds down to a compact 8cm. That`s right, 125 pairs stored in a 8cm high folded box. Earring Holder text, images and video are copyright.